Vinegar is one of my favorite things to buy in bulk. It is such a workhorse around the house. You can use it for so many things and it costs so little. Save money (and toxins) by doing any of the following ways to use vinegar. Replace common household cleaners and beauty products with vinegar and water. It’s actually pretty surprising just house versatile it is. I prefer white vinegar because it has no color and can be used for so many things. Pin this post for later and share it with your friends! You’ll want to come back and try out all of these ideas. I’ve personally seen this work and it’s so much cheaper than other drain openers. First, heat the white vinegar. Then pour 2-3 teaspoons of baking soda down the drain and follow with the heated vinegar. Wait a few minutes and follow with water. Straight vinegar in a spray bottle works wonders on glass. Just spritz white vinegar on mirrors and clean with tissue paper for a streak-free shine without having to use ammonia-based cleaners. Baking soda and vinegar are amazing at cleaning soap scum and other residues off sinks and countertops. Make a scrubbing paste for sinks and countertops by mixing baking soda with white vinegar. *Remember from science class that the mixture will bubble up and become unstable. Do not store it in a closed container or it could explode! Use vinegar to replace your car’s windshield washer fluid! Just put a 50/50 mixture of warm water and white vinegar into your windshield washer fluid storage. It works great! All you have to do is let the vinegar soak in the toilet and it loosens up all the filth, so you can wash it out with no effort. Let 2 cups of vinegar sit in the toilet for a few hours before you clean the toilet; it will do most of the tough work for you and disinfect all at once. Use vinegar to get rid of bad odors from your garbage disposal. Pouring vinegar into your garbage disposal will remove bad odors. Just dump some white vinegar down into the disposal – simple! 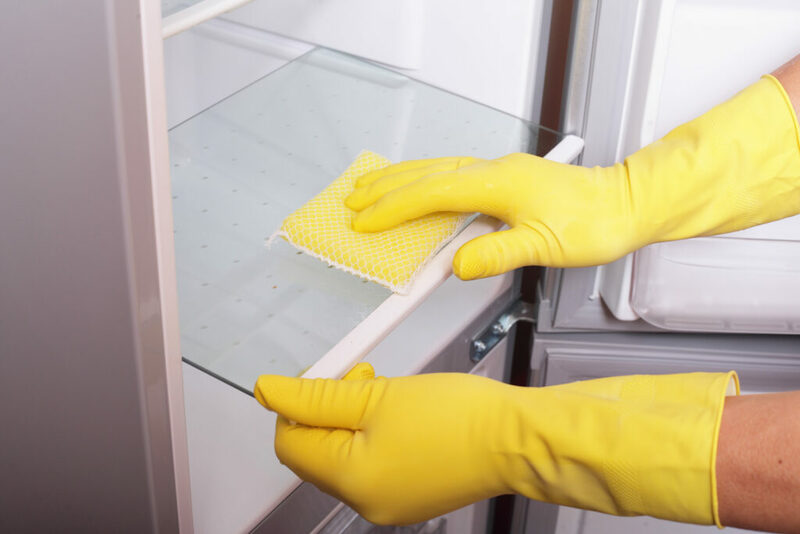 Yup, soap or hard water residue will slow down your dishwasher, but vinegar can help! Just fill the detergent compartment with vinegar and run the dishwasher on an empty load. Mix together a 50/50 combination of vinegar and water and use it to wash down the shelves of your fridge. It will smell great too! Loosen stuck-on food particles in the microwave by boiling 1/2 cup of water and 1/2 cup of white vinegar in a microwave-safe bowl. Then, it’s so easy to just wipe away the mess. Vinegar can also loosen up the grime and buildup off of your grill. Just pour vinegar over the grates and use your grill brush to scrape it away. In addition to the grill, vinegar can cut the grease on your stove, oven, and other kitchen appliances. Just wipe the inside or top with white vinegar. Next, use vinegar to make your computer monitor and keyboard look like new. Wipe them down with a cloth damp with vinegar. This helps get rid of sticky fingerprints and other gunk. Soak your stained food containers with vinegar, and watch the stains go away. A 50/50 mixture of white vinegar and table salt makes a paste that is perfect for cleaning tarnished brass or pewter. If you have a Keurig or similar single-cup coffee maker, run 2 cups of white vinegar through it monthly to keep mineral deposits from forming and help your coffee machine running great. This also works fantastic for multi-cup coffee makers too. Wipe down doorknobs and faucets with half water, half vinegar mixture. This will disinfect the surfaces. Don’t worry about coffee stains in your cups. Just gently scrub stains with equal parts vinegar and salt (or baking soda) and you’ll see the stains wash away. Those plastic containers with funky smells are no match for vinegar! Swab plastic containers with a cloth dampened with vinegar. Easily use vinegar to get rid of clothes stains. Rub clothes gently with vinegar to get rid of scorch stains or antiperspirant marks on shirts. To make your clothes stop clinging to you, just add vinegar to the washing machine. Add ½ cup of white distilled vinegar to your wash cycle because the acid reduces static and keeps dryer lint from sticking to your clothes. Soak old socks and sweaty clothes in a vinegar solution. Add 1 cup of white distilled vinegar to a large pot of water, bring to a boil and drop in the stained clothes. Let them soak overnight, and in the morning stained clothes are fresh and bright. I love to use vinegar in the washing machine, it really helps brighten clothes and removes bad smells. No more harmful chemicals! Pour white distilled vinegar on the weeds growing in the cracks of your walkway and driveway. Saturate the plant so the vinegar reaches the roots. Use vinegar on your skin, too! Vinegar can help bug bits stop itching, too! Dab a cotton ball soaked in white vinegar on mosquito bites and insect stings. It will stop them from itching and help disinfect the area so they heal faster. Amazingly, you can fight bad breath and whiten your teeth with a little bit of vinegar. Just brush your teeth once a week with white distilled vinegar. To do this, dip your toothbrush into the vinegar and brush thoroughly. Before you apply your favorite polish, wipe your nails with a cotton ball soaked in white distilled vinegar. The clean surface will help your manicure last. Enjoy cats and make their boxes not stink! Eliminate bad smells by pouring a half-inch of white distilled vinegar into the empty litter box. Let stand for 20 minutes, then rinse with cold water and fill with your favorite litter. One of the most frustrating things about boiling eggs is putting them in the pot and hoping they don’t crack. Add two tablespoons of white vinegar to the boiling water. The eggs will stay intact, and the shells will peel off more easily when you’re ready to eat them. Add 2 tablespoons white distilled vinegar to one-pint water. Use the mixture to wash fresh fruits and vegetables, then rinse thoroughly. The solution kills more pesticide residue than does pure water. Trying to remove stickers off products – like jars – is pretty difficult, but vinegar can speed up the process. Apply vinegar to the sticky gunk, wait a few minutes, and then wipe it away. I adore all the ways I can use vinegar around the house. I always enjoy hearing what works for you, so leave a comment and tell me your favorite use for vinegar around the house, and be sure to look for me on Pinterest for lots more tips. 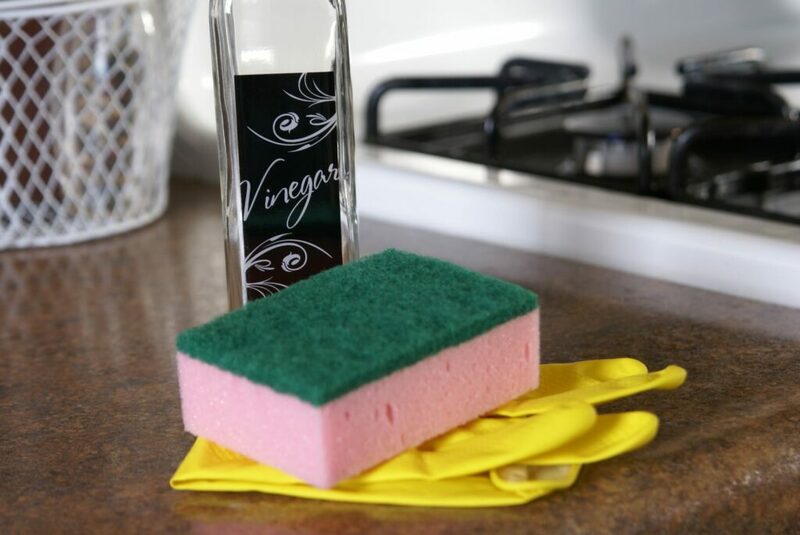 We welcome your household hacks and tips for using vinegar!